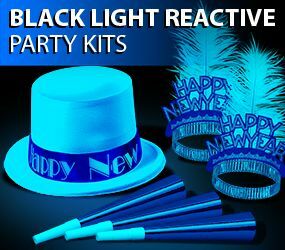 Bulk New Year's Eve party kits and packs available in many colors and themes offered at wholesale factory direct pricing. 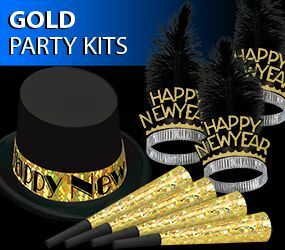 You will find new year's eve party kits in the most popular colors and even some unique and themed New Year's Eve Party Kits. Shopping for New Year's Eve Party Supplies has never been easier or more affordable. 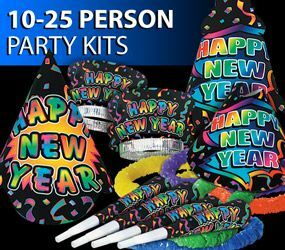 Party Express offers bulk New Year's Party Packs at Factory Direct Wholesale Pricing. Use these Inexpensive New Year's Eve Party Packs to start your New Year's Party off with a bang. 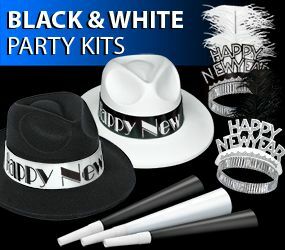 We offer multiple styles of New Year's Eve Party Kits fitting any theme. 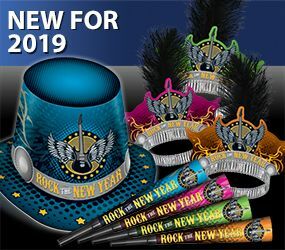 PartyExpress.com has the best collection of New Year's Hats, Horns and Tiaras. 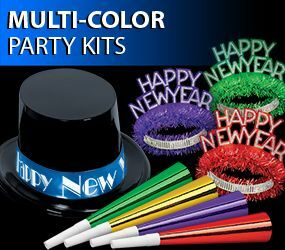 We have over 100 New Year's Eve Party Kits in stock, so you are sure to find the perfect color and theme Party Kit for your Special Event. We make it easy to shop to! 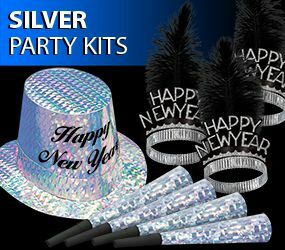 Take a look at our Silver NYE Party Kits, Gold NYE Party Kits or Themed NYE Party Kits. We cater to all businesses so do not hesitate to reach out to us with a quote request or questions. The friendly staff at PartyExpress.com is well trained to help you with your New Year's Eve Party Supply Purchase. Ordering in bulk is the smart and fun way to celebrate on December 31st. It is smart because you get exactly what you are looking for at a discounted wholesale price and you do not have to worry that the party store will not have enough hats to meet your demand. If you are looking for those last minute party favors, Party Express will make sure that you receive ever thing that you need before your event. When you purchase one of our discounted New Year's Eve Party Kits you are purchasing a party in a box. All of the party kits will come with hats, tiaras, and noisemakers. We make celebrating New Year's Eve at your bar, restaurant, country club, or event space simple. Just select you color or theme and find the perfect new year's eve party kit for you. If you are not finding what you are looking for, it is OK. We are a manufacturer of the new year's eve hats, horns, tiaras, and party supplies! Give us a call at 1-800-455-7280 Monday-Friday 8AM-5PM EST and we can discuss creating custom options to make your event even more spectacular! Party Express will make wishing your guests and happy new year easy and affordable. We are the manufacturer and we have over 100 years of experience in manufacturing quality party supplies and discounted wholesale prices. So leave the details to us and place your order for your new year's eve hats and tiaras with PartyExpress.com! When you are shopping for New Year's Eve party supplies you want your shopping experience to be fast and painless. 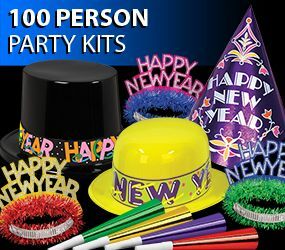 That is why a New Year's Eve party kit for up to 100 people is the way to buy New Year's Eve Party supplies. 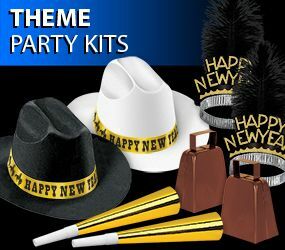 In these kits you receive coordinated party items like party hats, new year tiaras, noisemakers for ringing in the new year, and party beads. With purchase of these kits, which usually cost around $1 per person you will save both time and money when planning for your New Year's Eve party. These New Year's Eve Bundles come in one neatly pack box that is easy to distribute on New Year's Eve.